We are nearing the end of April and at this sort of time I always seem to be thinking about what I can finish off before the month end! Deadlines and such do seem to help my focus and step up my productivity. I think I'm happy with it now! 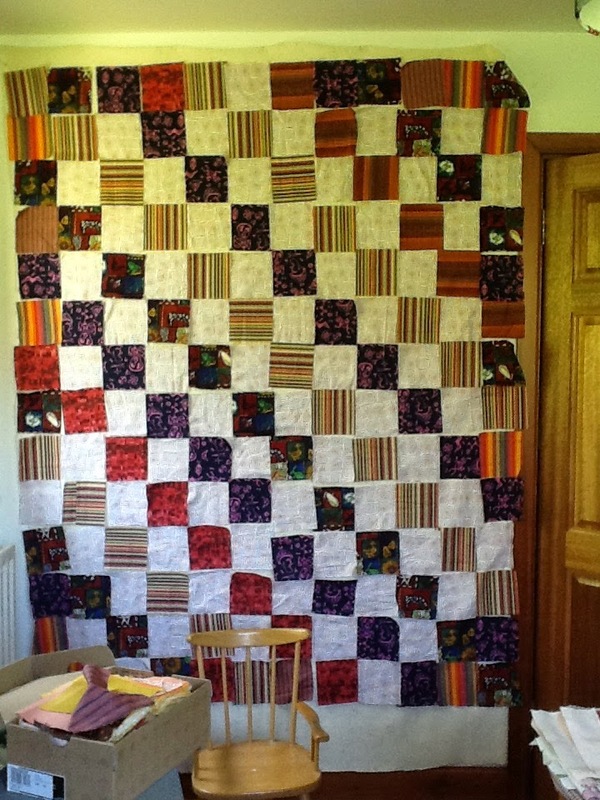 Just got to piece a back and get it quilted.....a job for next month I think! 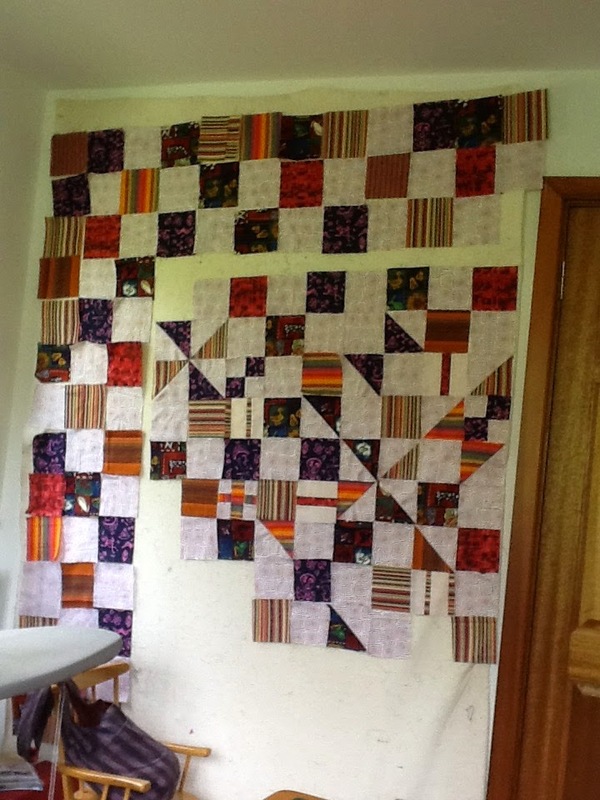 To finish the rest of the quilting I will need to quilt 50 clamshells per day! I'm a bit behind my target but within reach I hope, though my poor needle grabbing fingers are a bit tender at this stage. 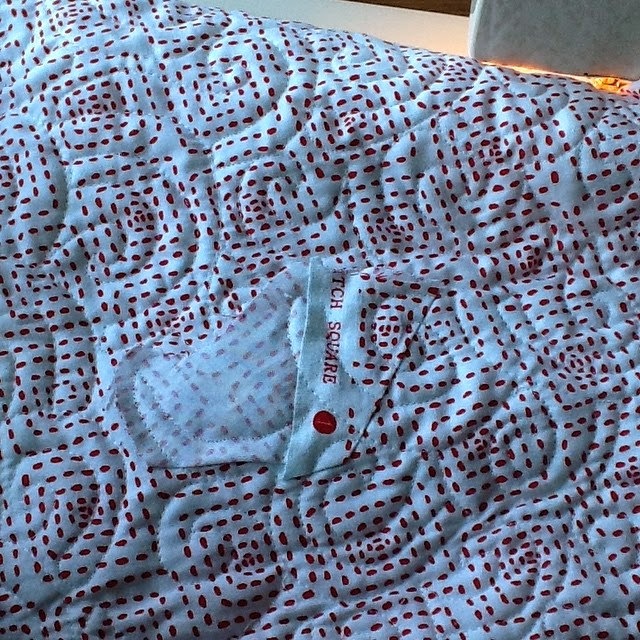 I will then have quilted the main part but have yet to decide how to quilt the border so it will not be a grand finish this month but I seriously hope it will be next month! Nothing beats a scrappy finish does it!? 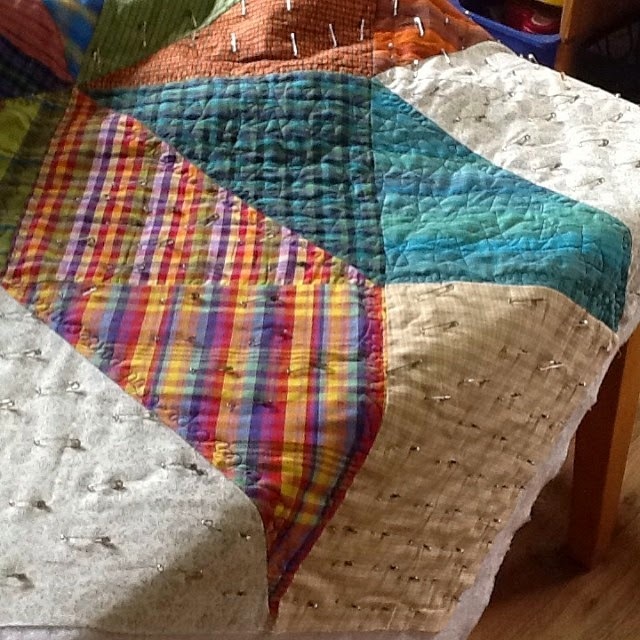 All that work to fit your fabulous scraps into something gorgeous. Something that probably has little reminders of lots of projects or in this case lots of charm swaps! I just love that! Now I wonder if Leanne has got her scrappy thing going - loved her Liberty nine patches from last week didn't you? Over at Simply Solids Blog too! I'm trying to be everywhere today! Well here anyway! With the quilt I made from this fabric! Full reveal here tomorrow I guess! Otherwise checkout the link! 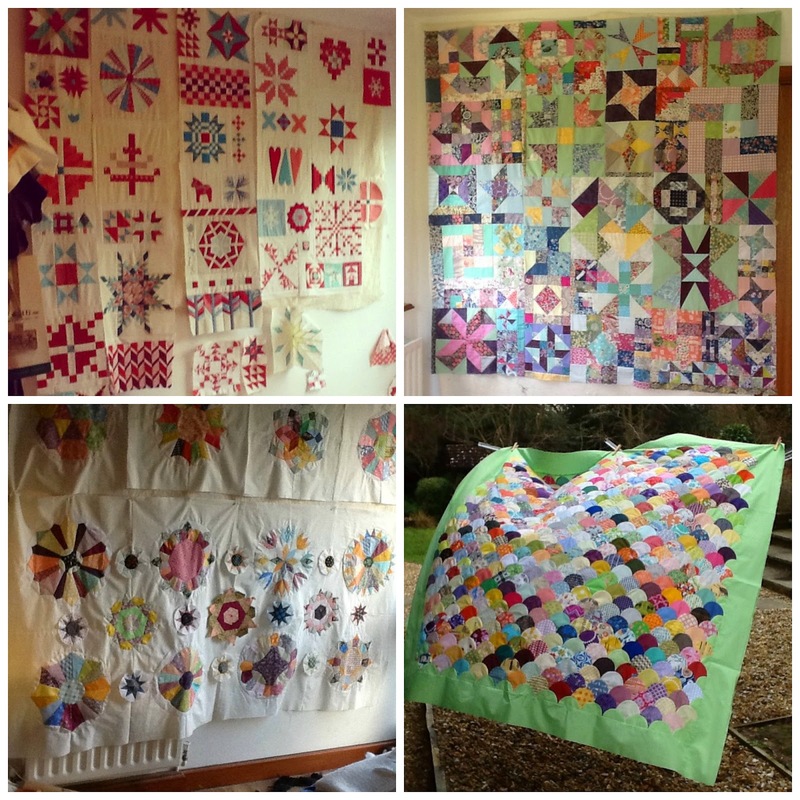 This year's mission, if you can give it such a grand name, has been to finish making my UFOs and to use up my large quantities of scraps, making more quilts for Siblings Together 2015. Camps start in July. I had planned on making ten if I could! 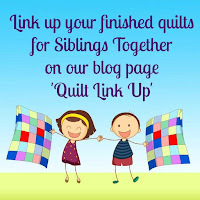 The girls in the fabulous Siblings Together Bee started talking about getting quilts for all the kids at the summer camps and we started our campaign to make 100 quilts! A tall order I know but we reckoned there are three bees making for Siblings Together as a start. Then we have had great support from some of the modern guilds in the UK. And some super individuals! 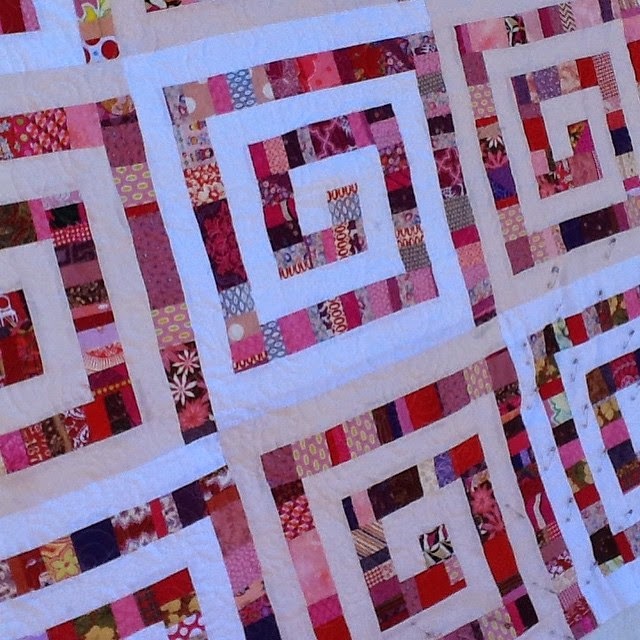 Yesterday there were 38 quilts on the list of finished quilts we know about. 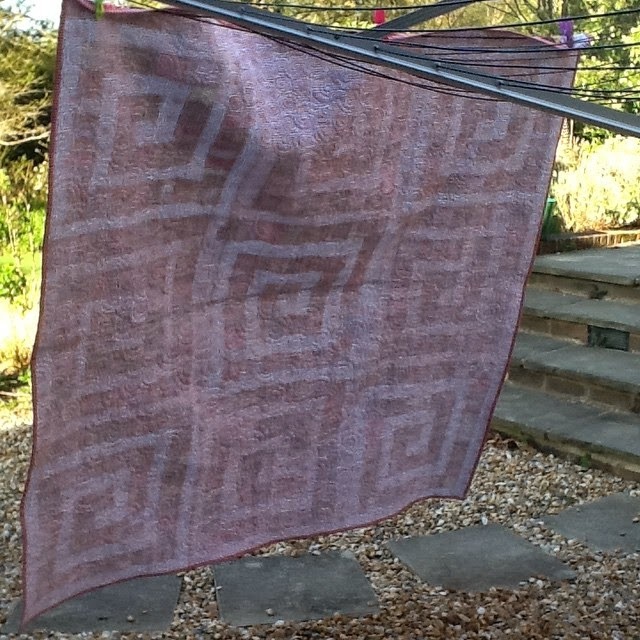 Last night I just finished no 39 .... Raspberry Ripple! 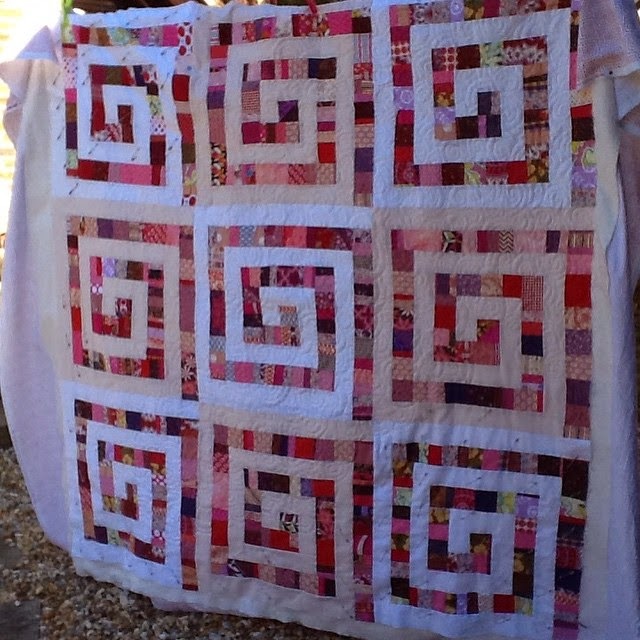 This quilt has used up lots of red/pink scraps and a bit of white/pale pink background. 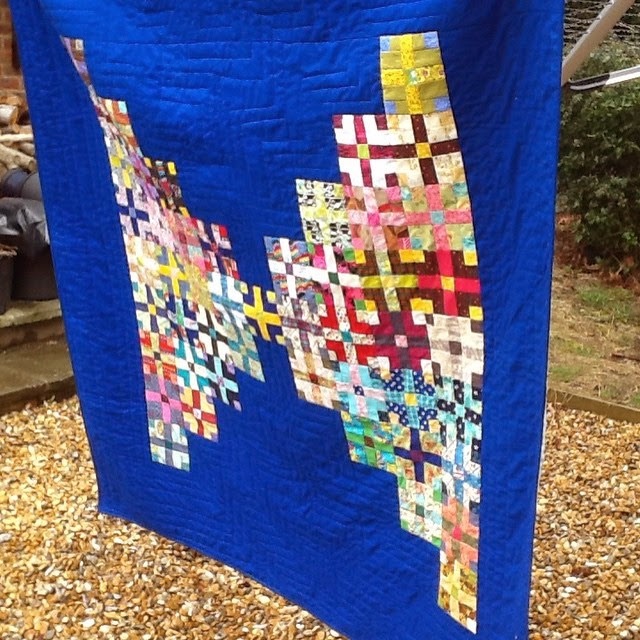 I have to confess this one came out a bit wavy but the FMQ seems to have sorted out some of that. 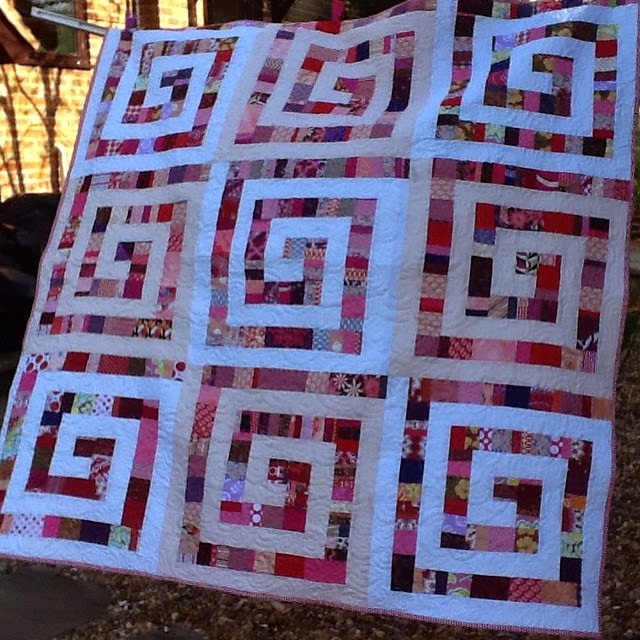 Quite a girly quilt I think. 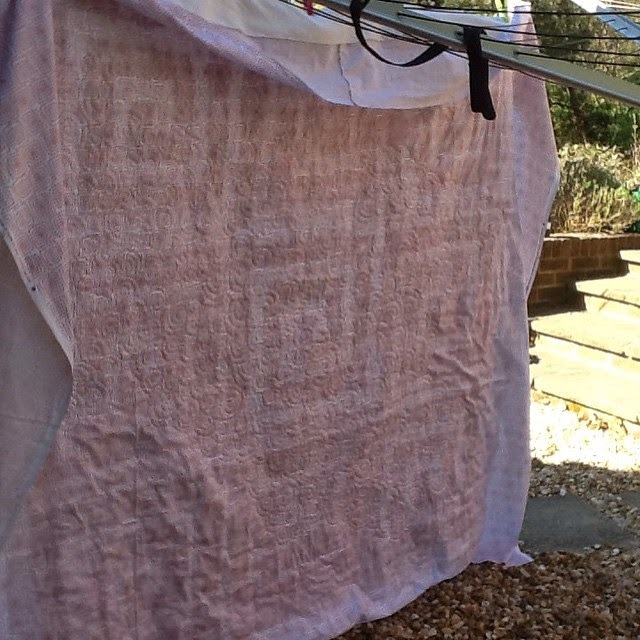 Lots of IG support helped me snip and fray that naughty piece of fabric away! I guess I'm not the only one to have these mishaps then! Should you like to make one, there is a tutorial of sorts here. Hope you want to dive right in and make one for Siblings Together....? Once all the filling is made the rest is quick and easy. It started with this one - called Marmalade! And I'm working my way through as many variations as I can! Plum Duff is next and is going to be a beauty - had help with the filling from the lovely Victoria and the backing has been supplied by Helen - what lovely generous friends they are! 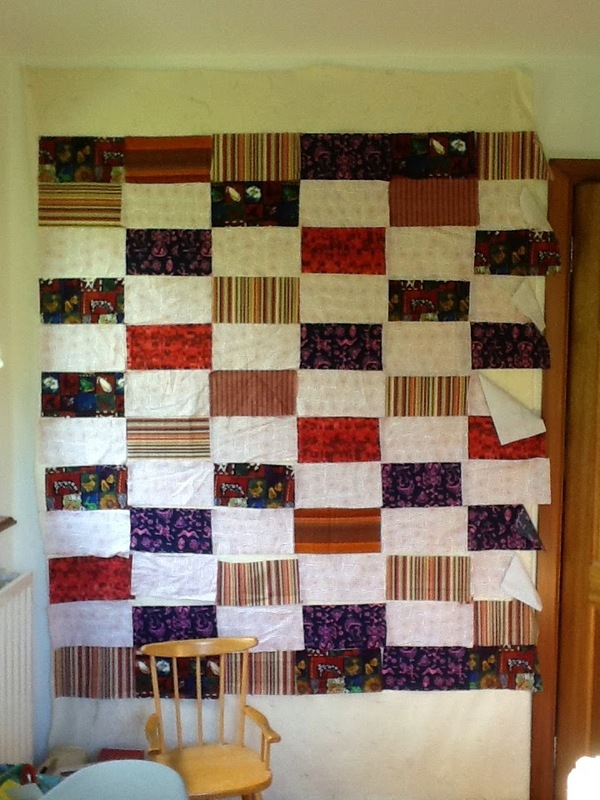 So if you would like to make a child happy, make a quilt - it is a simple as that! 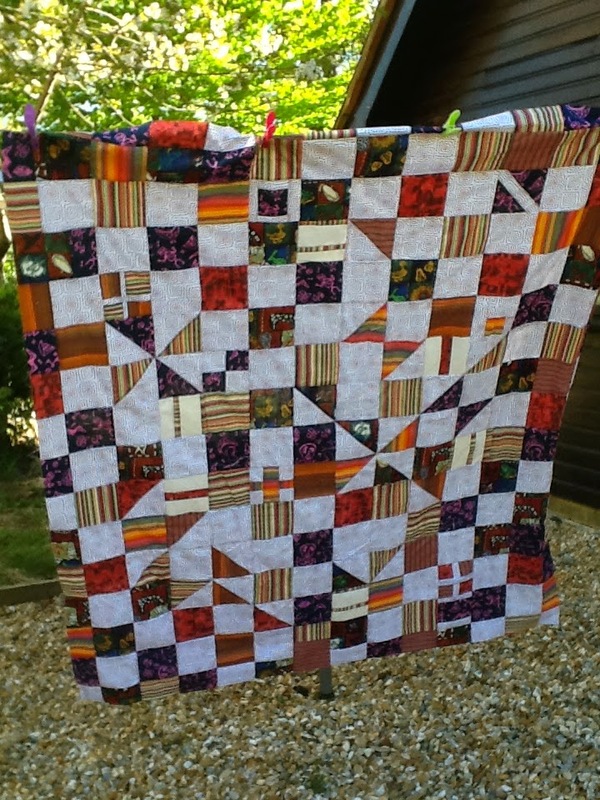 Offers of blocks, fabric, quilting, binding, backing, wadding, money, tea and cake and encouragement gratefully received! If you'd like to help, please comment and I'll put you in touch with the right people! 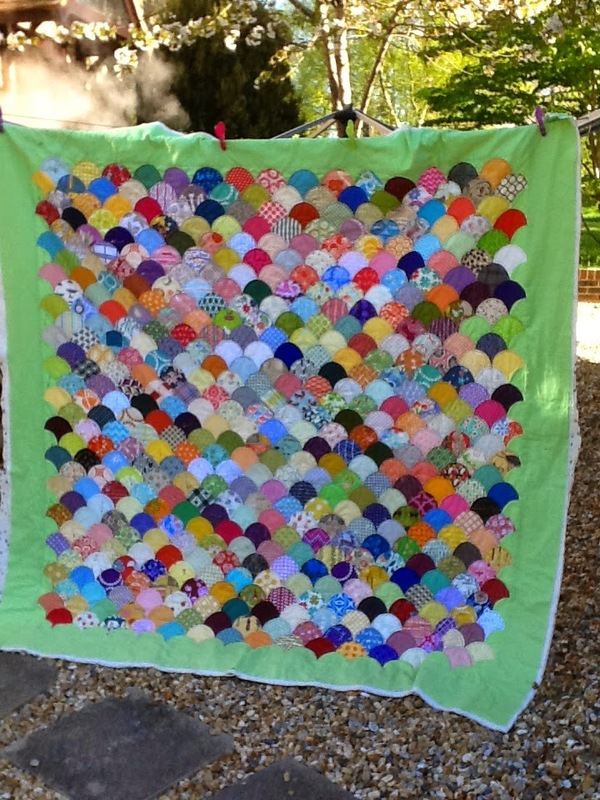 I'm also thinking that for next year it would be helpful to have more bees making quilts. 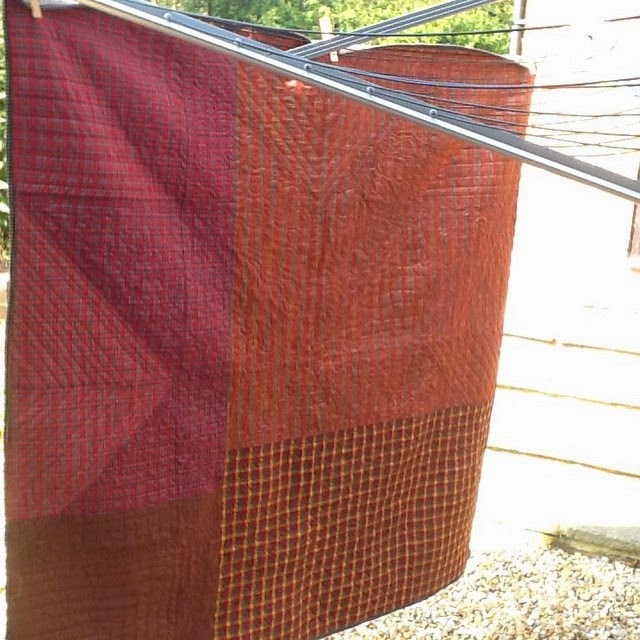 Our bee has gone for making one very simple large block from stash - it has been fun and very easy to do! They are also a super bunch of lovely people. I am happy to run one if anybody would be interested ... and will probably want to join in the fun too! Just comment below to let me know you want to be in! 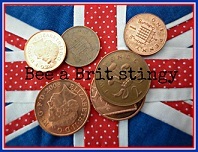 Great for your first bee if you want to start out! 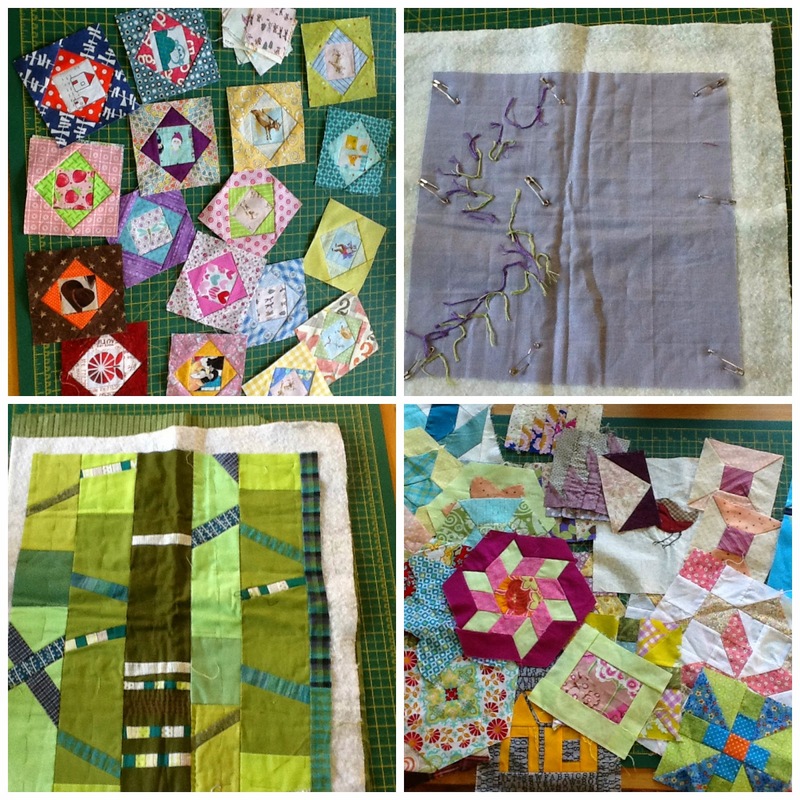 #Scraptastic Tuesday - April Winners! Sorry been a bit slow to get going this morning! The kids are back at school this week and I was on driving in duty! 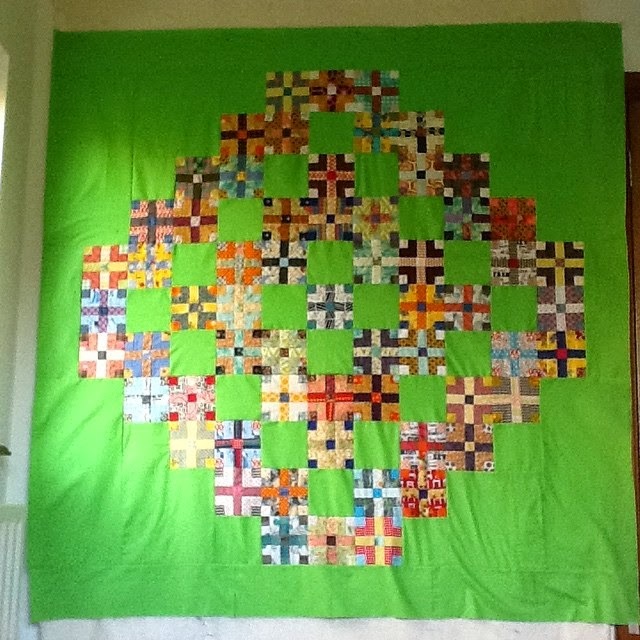 Yesterday and today I have been quilting my latest Siblings Together quilt - the July deadline (when summer camps start) is getting ever closer and we still need plenty more quilts so I am doing my best to provide as many as I can. I am sure there are a few more in the process of being made elsewhere in the UK/world but I am a little nervous that we will not reach our 100 target and don't want to let those children down. 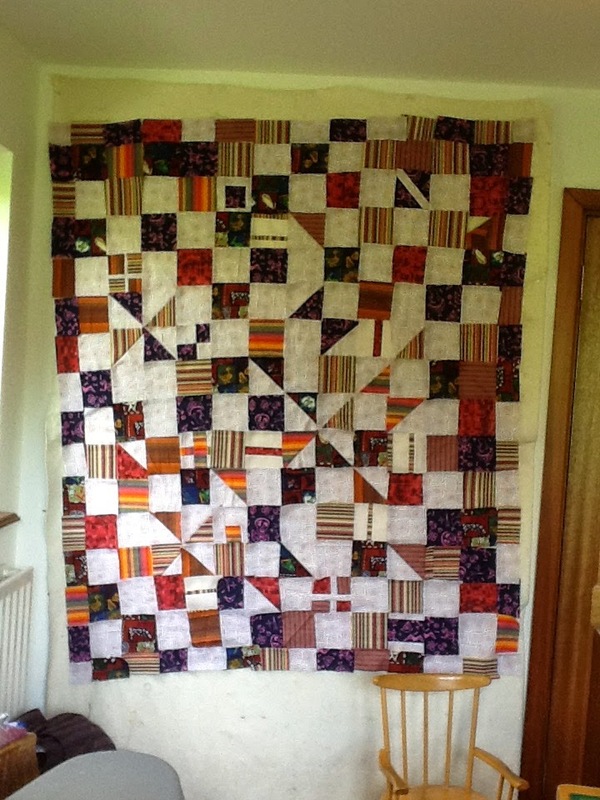 This has been a really easy quilt to put together using lots of scraps for my 'filling' - that is the most time consuming bit. Making the blocks and the top itself is a bit of a doddle! 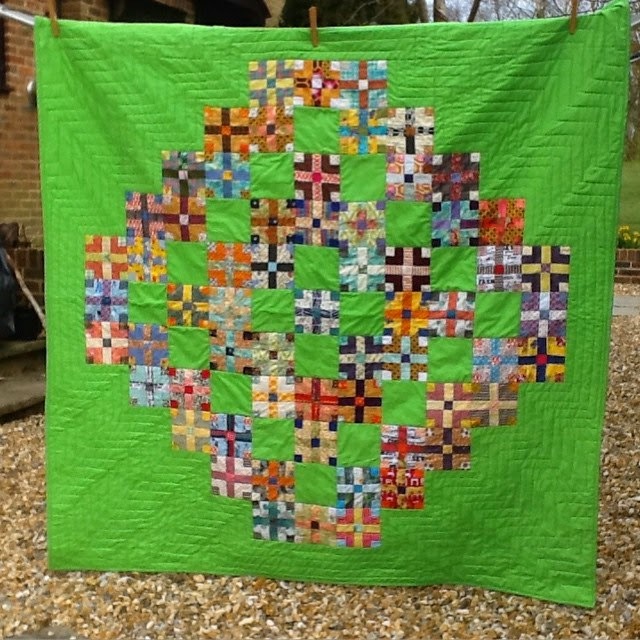 As the blocks are not as flat and square as one might like them to be, quilting FMQ style, with a swirly pattern, seems to rectify a multitude of sins! The swirliness seems to draw up and gather any excess - could be my favourite pattern and certainly one I don't have to think much about. And how it looks on the front! Hope to finish today or tomorrow....keep your fingers crossed for me! 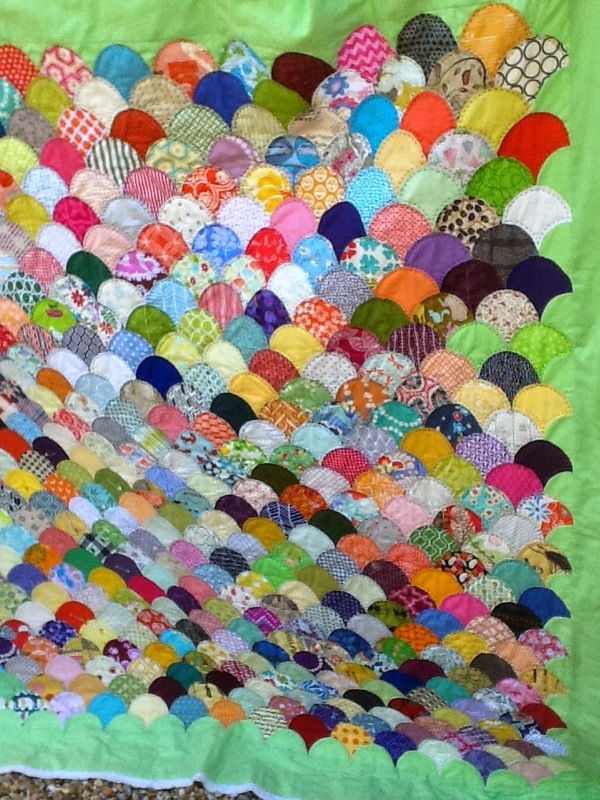 Green Fairy Quilts - $25 gift certificate 7 - Karen from Quilts...etc. 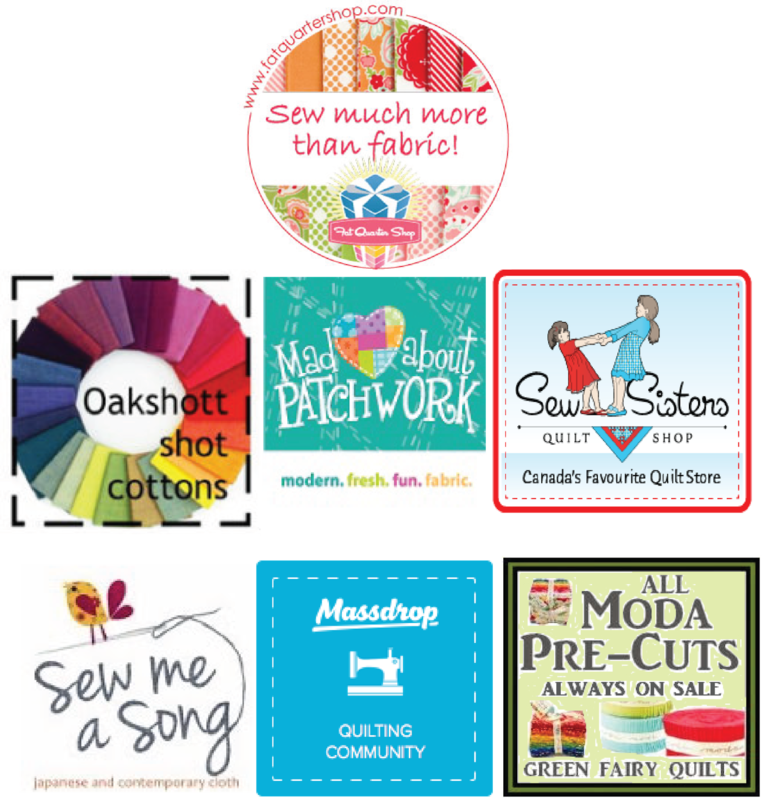 A big thank you to everyone who linked up to join Leanne from She Can Quilt and I for April's Scraptastic Tuesday Link Up. You can visit there anytime to check out everyone's projects. We hope you will join us again for the May link up, on the second Tuesday which will be Tuesday May 12, 2015. And here we are again! The April Link Up! This means we have been doing scrappy thing for seven whole months! Would you believe it!? Must say my scraps do seem to have diminished a little - at least the scraps do seem to stay in the boxes I have to store them, which is better than the mess on the floor round them, that I used to have, as they spilled over. But there is still a long way to go before I could say I have got them under control! This week I've been working on several things! It seems to keep me energised and interested. 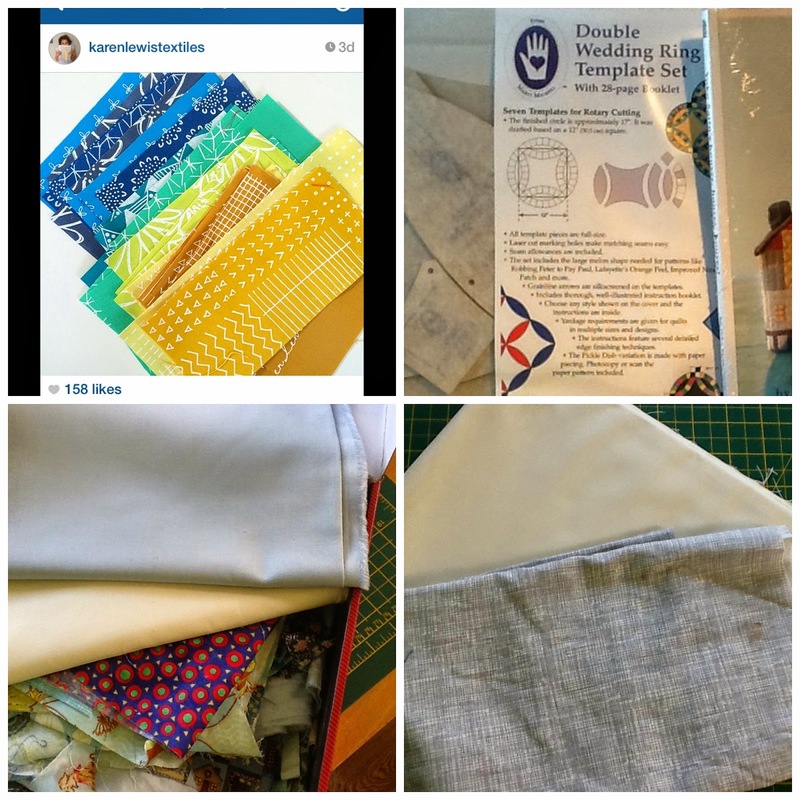 I had fun testing a pattern for a foundation pieced tiny featherweight sewing machine for Grace (IG @chainofdaisies). I don't often do paper piecing but I did love making these cute blocks which finish at 5". She has a pattern out now in her newly set up Etsy shop. I did use some scraps for these but made a whole mess more - they went in the bin I have to say! The blocks will be added to these bigger sewing machines for my Bee a Brit Stingy partner Collette. She is wanting a row of sewing related items to go with her spools row! I'll be passing two rows on down the line to Di. And receiving my next row at the end of the month. I have also been doing a bit of a clear out of drawers and such and found these blocks which are leftovers from other projects - they count as scraps right? Prefer this one myself! Sadly when I looked in the EQ library it only had one pieced hexagon so we just have to imagine different ones! If you have any hexies to share just leave a comment and I'll get back to you. Now let's find out what you have been up to! The giant star quilt (pattern by Jeni Baker @incolororder) which managed to lie undetected for months if not a year or so has been finished! but perhaps it was the decision to donate this one to Siblings Together - a reason to finish it maybe. Or was it just because at last it had been put on a list - my FALQ2 list? Anyway it got finished quite quickly really....makes me wonder why I didn't do it long ago? 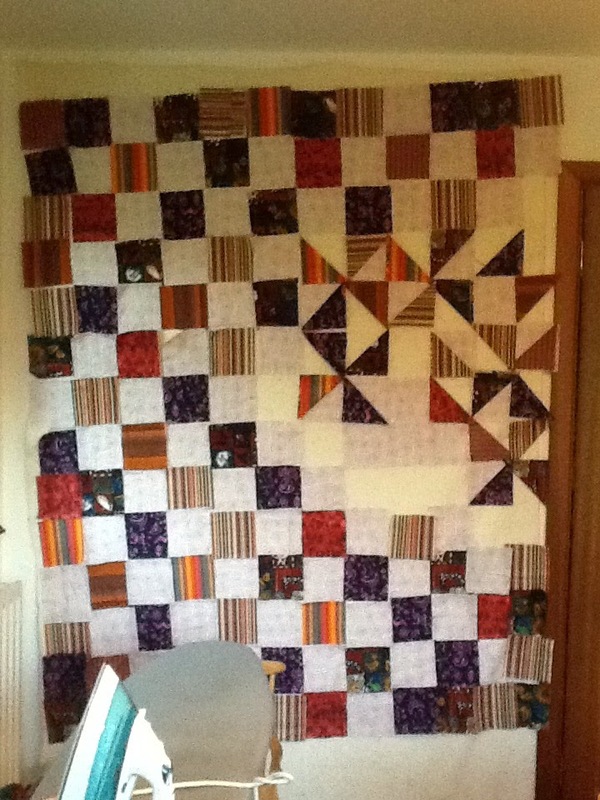 I had started off quilting star related words around the edges of the star way back when and a few science fiction quotes ....from Star Trek and Doctor Who! 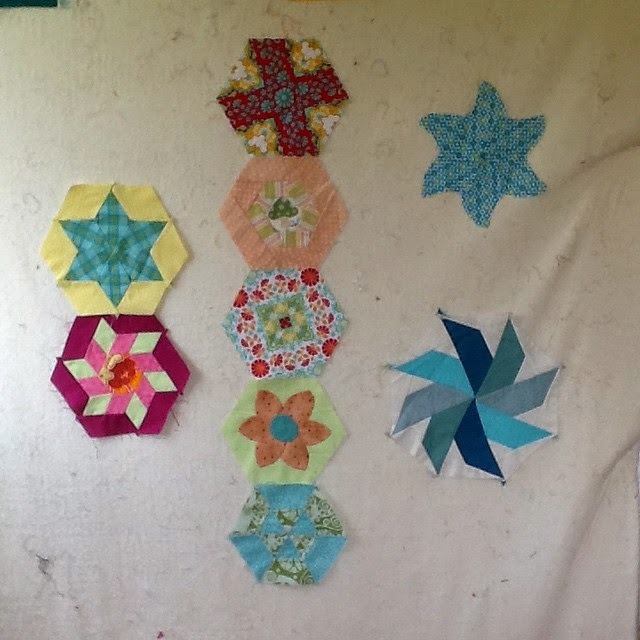 Then I was filling in the star diamonds with FMQ motifs. Yesterday I quilted the background with straight lines following around the star shape and filled in the remaining star points. I made my binding too so I only had to stitch it on this morning. I will be very happy to pass this one onto Siblings Together - you never know it mind end up in the hands of a future astronaut, a science fiction writer or just someone who likes to dream...? 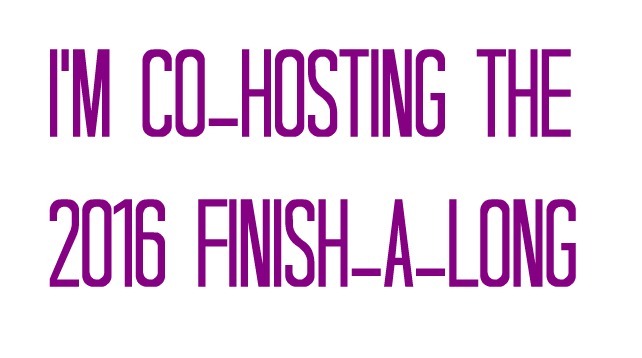 I will be linking this finish up to Finish Along 2015 in July! You still have time to write your new list and join in - do it before April 14th ! 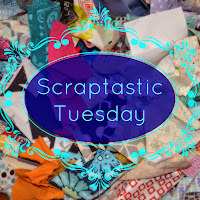 Scraptastic Tuesday - way behind today! I have had to do a little housework - piles of dirty clothes from five people does seem to mount up especially when they hoard it in their rooms for days and then stick it in the wash basket all at once. I have also been digging up things to go on my Finish Along list for quarter 2! Recently I have been finishing things off that didn't get onto a list so before I did anymore finishing I thought I should get my list together. 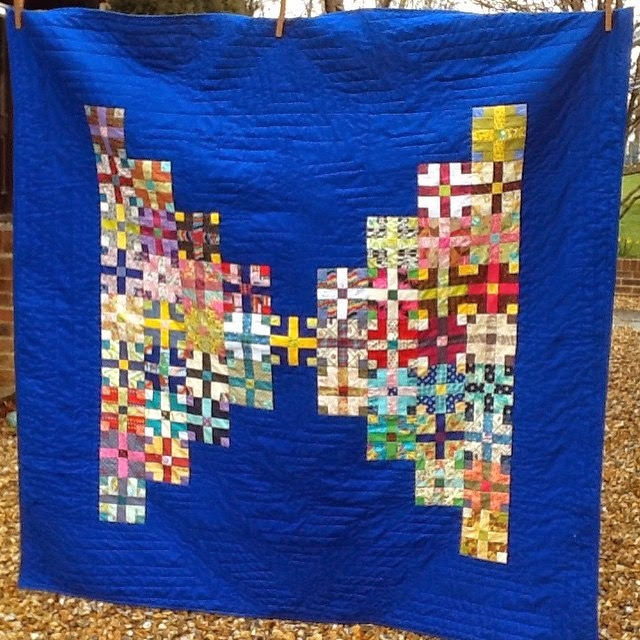 One thing not on my list is the last of my scrappy Hot Cross Bun quilts! 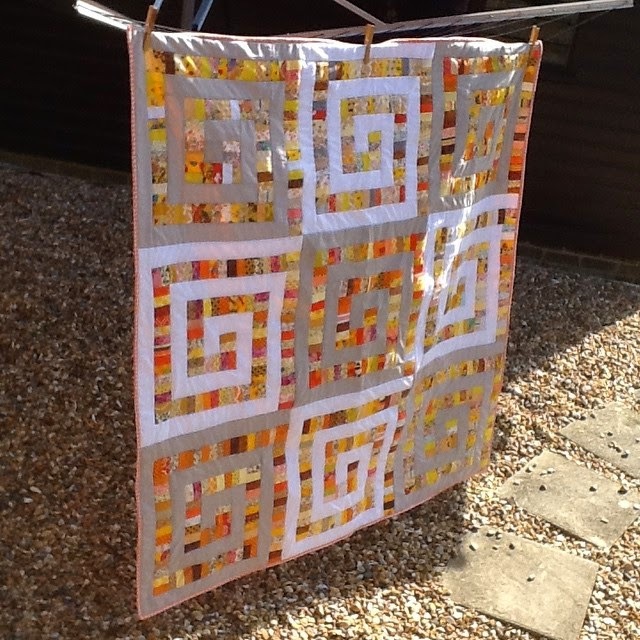 Sorry folks got to run - dinner to make and then I'm off to do a talk to the ladies at church about my quilts! Eeek first time and slightly nervous but that may be a good thing as I'm taking a huge pile of quilts and will need to talk fast to get through it all in half an hour! Wish me luck! My list for Quarter 2 is longer than the last quarter as I managed to finish nine projects off and am happy for a list to roll over to the next quarter if necessary. I didn't finish four on my Quarter 1 list but I have now finished four other projects that were not on the list! Go figure! Nordik and Vintage circles are still to be stitched into quilt tops. Nordik may even need a few more blocks and Vintage Circles is more a matter of appliqueing everything down... Clamshells is being quilted by hand - almost halfway and Scraptastic Sampler is a finished top waiting to be layered and basted. 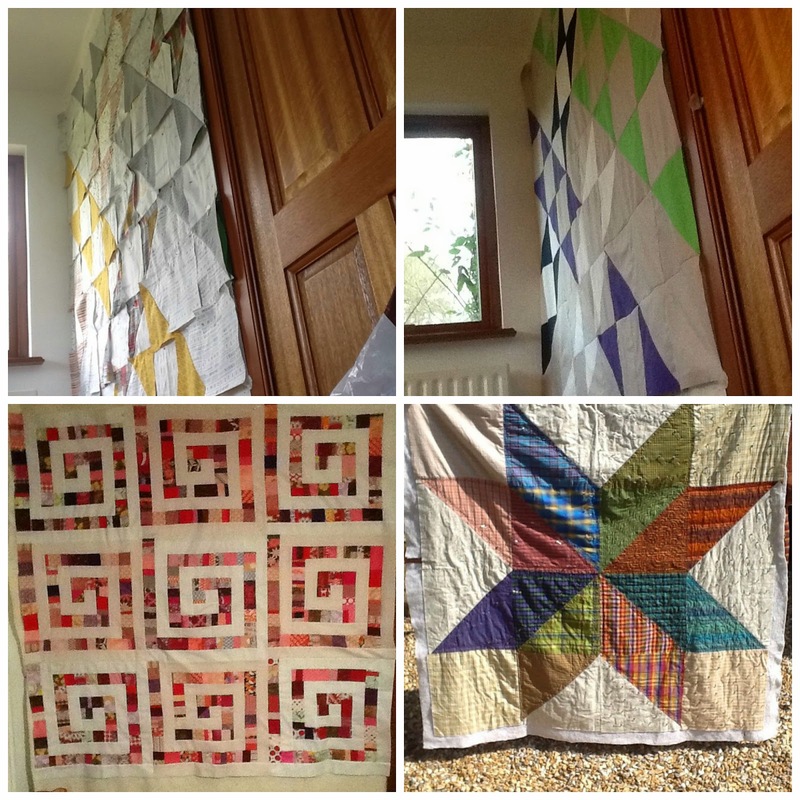 All finished quilt tops with the exception of the star quilt which is part quilted. Not much has happened with these as yet. 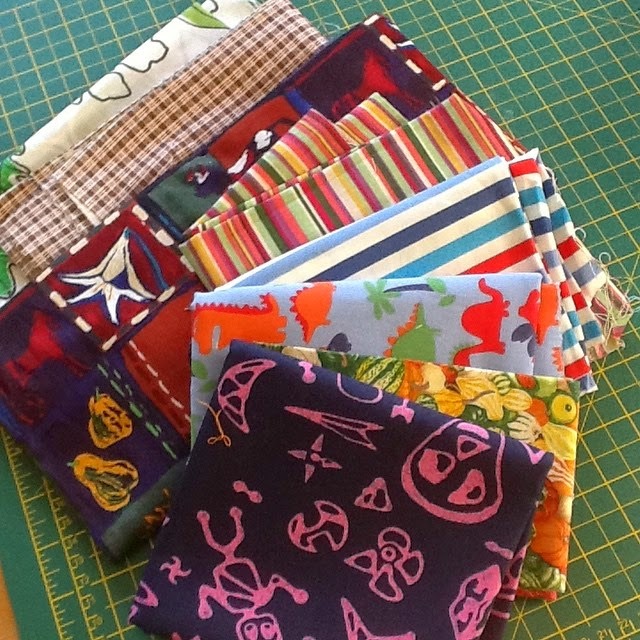 KLT2 - these fabric scraps are on their way from the lovely Karen to which I will be adding lots of LV ! 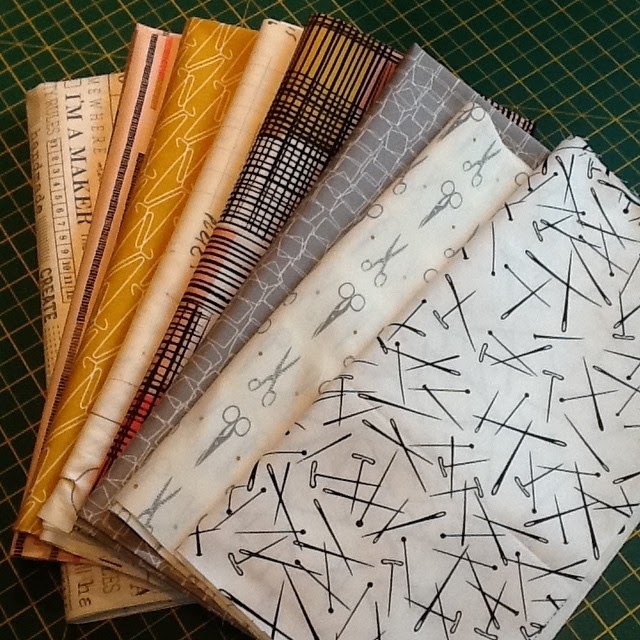 And the Wedding Ring Quilt is a template, a book by Victoria Findlay Wolfe and a promise to Trudi Woods plus scraps and stash ! 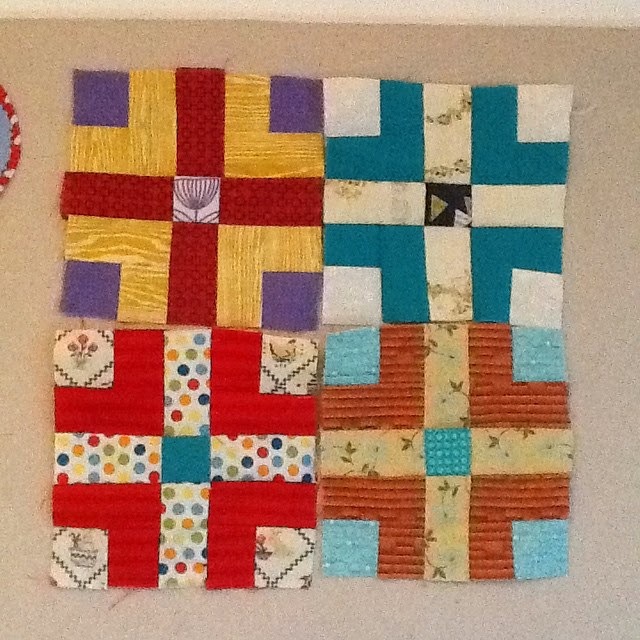 A pile of blocks that were left over and should be made into quilts for Siblings Together with a bit of help from others or more blocks from me - even happy to donate them elsewhere! 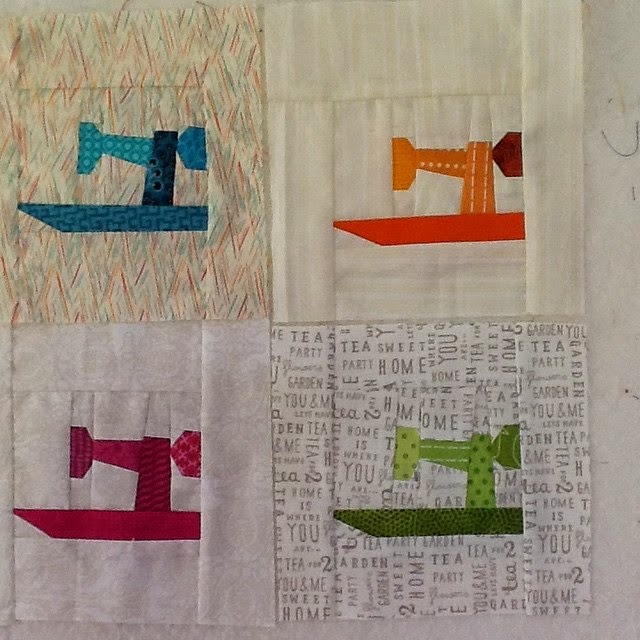 My Hand Quilting project from FQR14 with Jen Kingwell - thinking large pouch, cushion cover or mini quilt! I think that should keep me busy for a while! 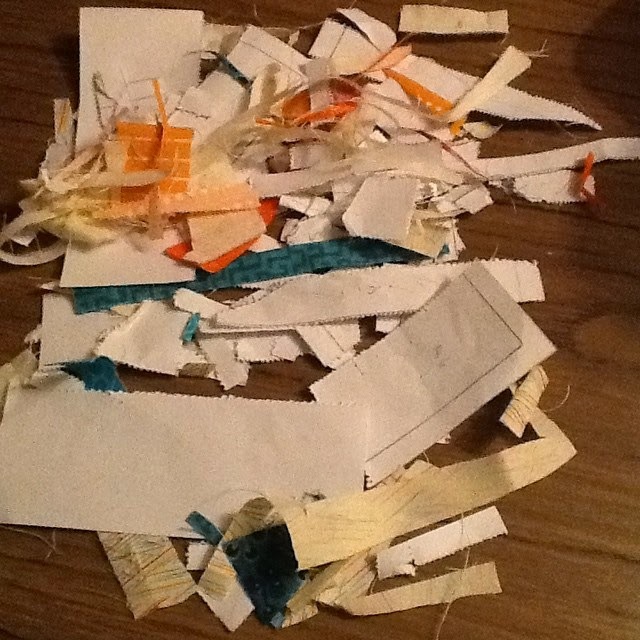 I have been really inspired this year to use up my scraps - boxes full of them! And to do so in aid of the charity Siblings Together - it is such a great cause and one that has touched my heart! 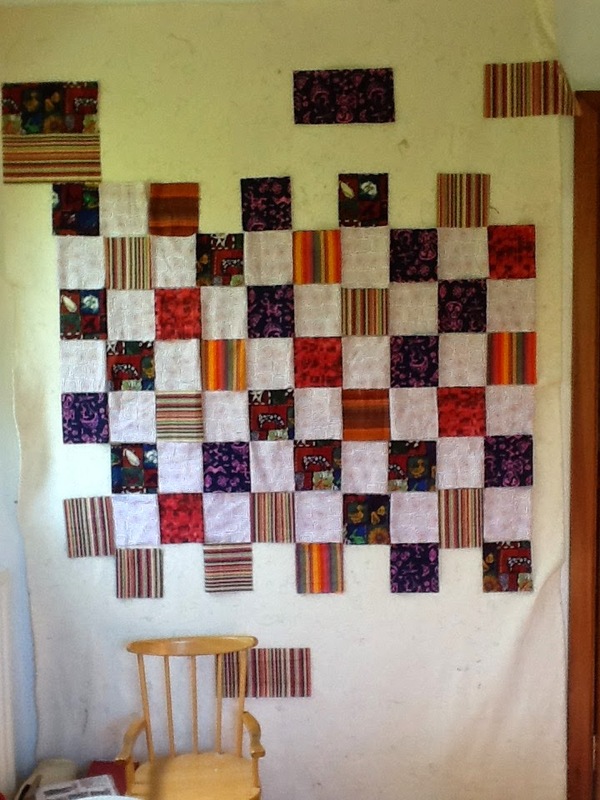 So when I intended to make one scrappy quilt I changed my mind to make three out of about the same number of blocks. 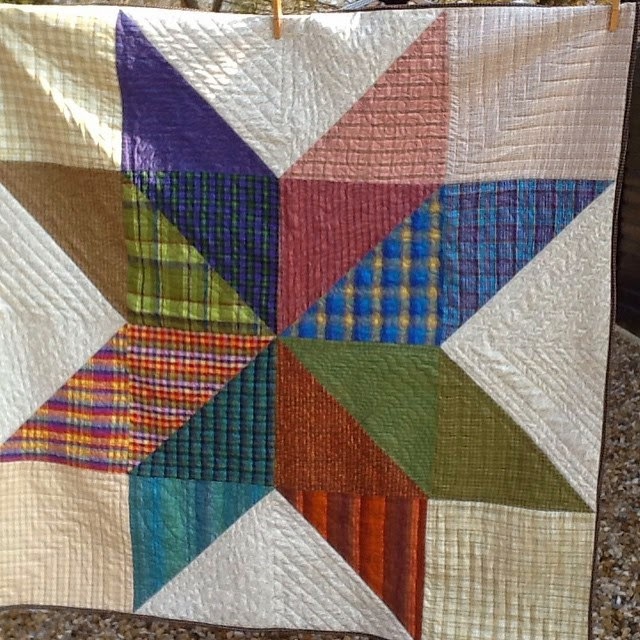 The Hot Cross Bun block from Bonnie Hunter's Addicted to Scraps Quiltmaker column. 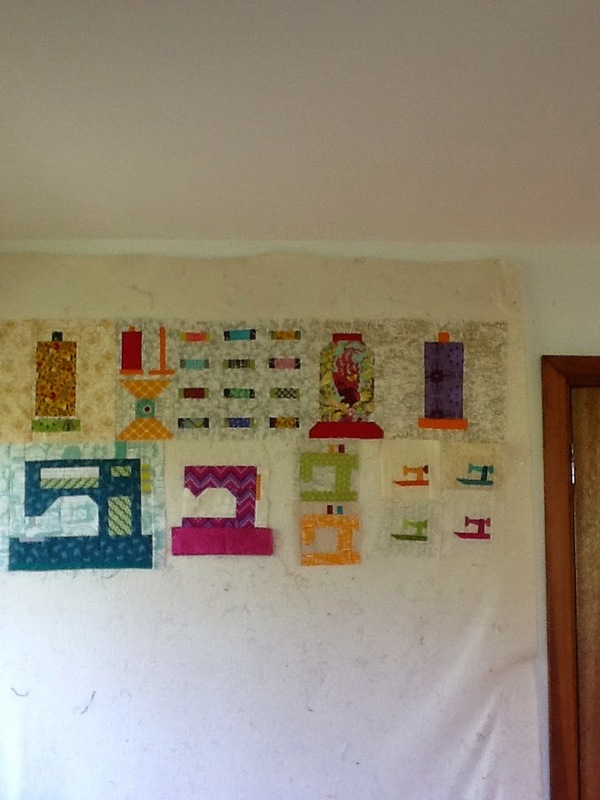 Bonnie has recently published a quilt of these blocks set on point and sashed and it is on the cover of Quiltmaker. Using 45 blocks though in the actual quilt I managed to add two rows so the total was 61 blocks and I opened up the centre area! 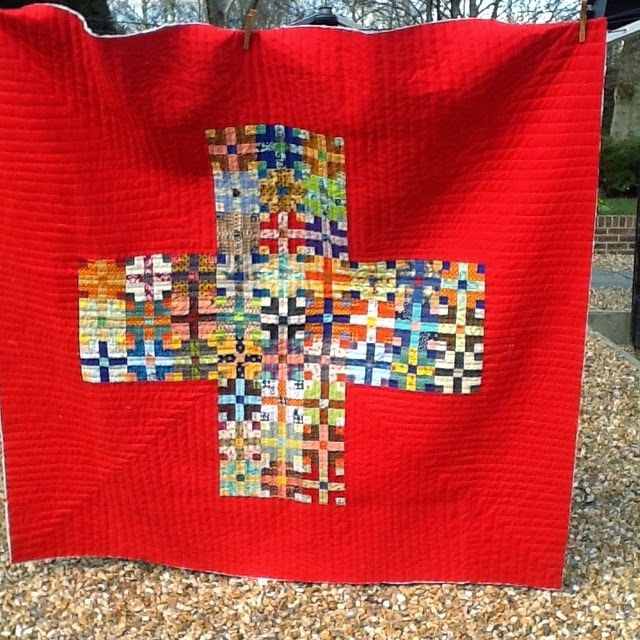 Red Hot Cross was finished first - it is bound - I just haven't taken an updated photo yet! Now I have Blue Ziggurat to show you! 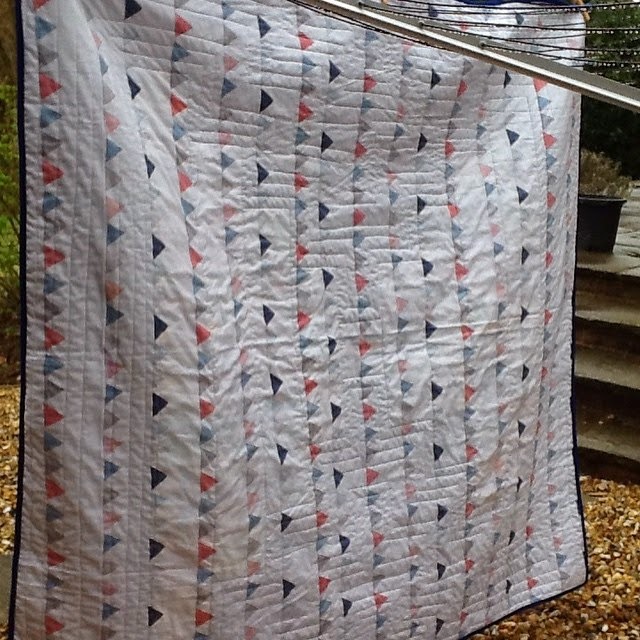 I was wondering how to quilt it and asked for suggestions on IG! I went with the simplest idea - to outline my blocks in that courthouse steps layout in very wonky organic straight lines! 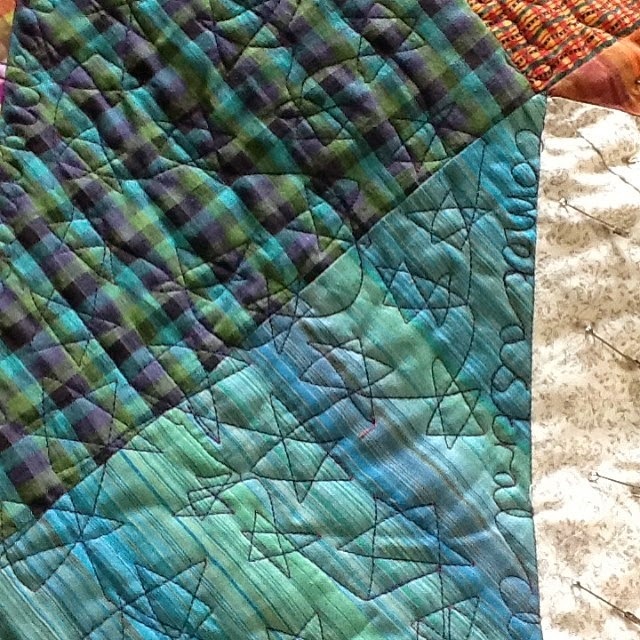 I stuck to blue thread so the quilting adds more texture than definition. Just as well I think! It is bound in the same blue fabric as the background, Kona Riviera and I did it all by machine with a little bit of handstitching where I missed catching the binding underneath! 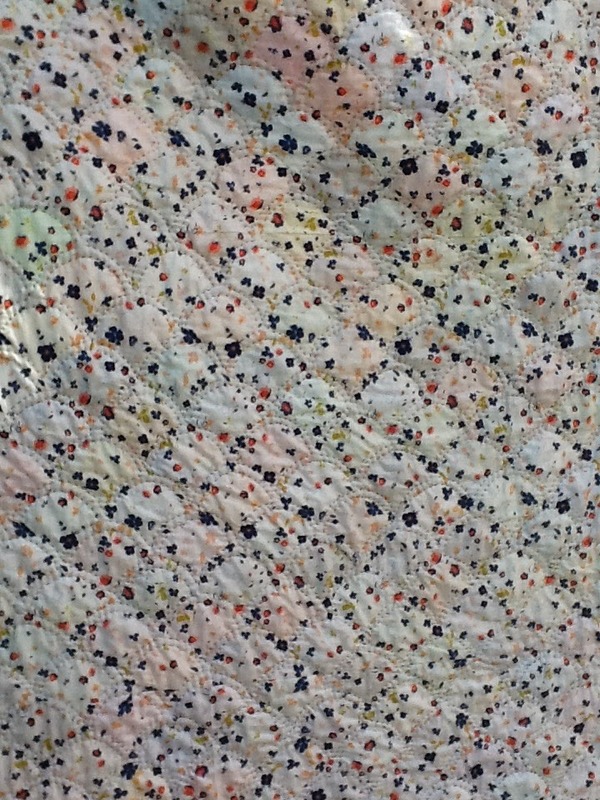 And here is the backing fabric which I found in a destash sale on IG (from Claire)! 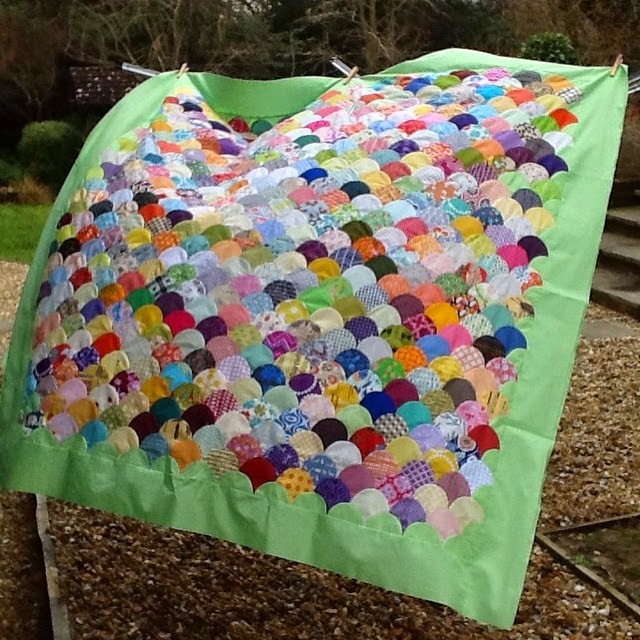 A cute bunting fabric which works well with this quilt I think! Only one of these left - the green one ! As I now have some backing fabric it may not be long!